The first thing you notice when you see a Ragdoll is his stature. Females usually weigh between 5.5 kg -7kg with Males around 9kg. This makes them bigger than 'normal' domestic cats. The Ragdoll breed is the largest domestic cat in the world and are even mentioned in the Book of World Records. Ragdolls tend to grow slowly so it takes about 3 to 4 years for them to fully mature. Ragdolls have a large coarse muscular build, with a big powerful chest and shoulders. The eyes are large, oval and always blue. The ears being large, rounded pointing slightly forwards. The tail is long and full. Ragdolls have a very soft, semi-long coat with longer fur around the neck and shoulders. All Ragdolls are "gepointe" cats, meaning that they face, ears, paws and tail are darker than the rest of their bodies. The kittens are born white, then after 10 days the colour and pattern develop rapidly with these traites becoming visible. 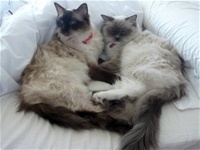 Most Ragdolls get increasingly darker as they age, and young cats usually have the greatest contrast between the points and their body colour. There are 3 standard patterns and four basic colours in this breed, you can find a colour chart on my next webpage. There are also new, non-traditional patterns and colours being bred. This is done by cross breeding with other breeds and old original Ragdoll lines. These include tortie points, lynx points, silver & cream points, red (red) / flame points, solid colours (no points) and other eye colours. This is still experimental and very exceptional so only a very few cat associations currently accept such variations, but eventually I'm sure they will become more widespread.